Lt. Gov. James Aiona, bottom left, listened along with others yesterday as Gov. Linda Lingle spoke at the Kahuku High School cafeteria on her proposal to buy the Turtle Bay Resort. 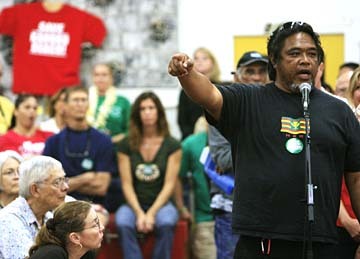 About 500 North Shore residents rallied last night at Kahuku High School in favor of Gov. Linda Lingle's proposal to buy the Turtle Bay Resort. Voices heard the most often and the loudest at her first public meeting on the issue were overwhelmingly in favor of Lingle's controversial pledge in her State of the State address to buy the 850-acre resort to protect the character of one of Oahu's last remaining rural coasts. The governor is preparing this week to name an advisory committee that would include members of the community, legislators and union leaders to flesh out the plan. Four members already named are Sens. Robert Bunda and Clayton Hee, Rep. Michael Magaoay and Eric Gill, secretary-treasurer of Unite Here Local 5, the hotel workers union. Lingle was joined by 13 members of her administration. She did not specify how much money it would take to buy the land -- something state lawmakers have been asking about. Laie resident Moot Ah Quin stresses the importance of respect with regard to sacred land during last night's meeting with Gov. Linda Lingle at Kahuku High School to discuss the fate of Turtle Bay Resort. "This is not about forcing someone to do what they don't want to do," Lingle said. "They have been trying to sell this property. We're a potential buyer." Tiffany James, a 15-year-old Kahuku High School student, was among at least 30 residents who spoke in favor of Lingle's proposal. "This is not a once-in-a-generation opportunity. This is a now-or-never opportunity," she said. Kuilima Resort Co., which has owned Turtle Bay since 1988, plans to move forward with proposed development of the site, which includes up to 3,500 hotel and condominium units. Nathan Hokama, Kuilima spokesman, said the company had not received copies of the governor's proposal, though a meeting is scheduled between Lingle and representatives of Kuilima's parent company, Oaktree Capital Management LP, on March 18. 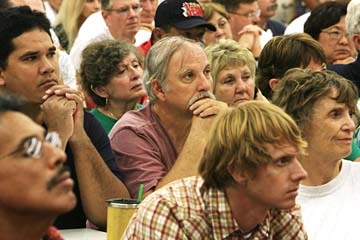 About 60 to 80 Kuilima workers were at the meeting. Punaluu resident Didi Herron, 59, in her testimony said: "We'll fight this (Kuilima's plan) to the death." The lone dissenting voice at the meeting came from Michele Auelua, a 34-year-old revenue manager for Turtle Bay. "I'm not completely convinced that the proposal is the solution for saving Turtle Bay. "There are so many state-owned entities that aren't well-kept in their current conditions. How can you assure me that by becoming the new landowner you are going to be able to protect the vision of keeping the country country if the state can't do that for its other public beaches and parks?"